Ideal for Special Occasions, Anniversaries and Special Events. These Items can be tailored to your needs. Provide us with your personal artwork or idea and we will create the rest. For more information on how to order Custom Product please call your Sales Representative or Customer Service. ORDER HERE - ORDER INFORMATION 90954 Bracelet Card $1.00 ea. Prices are subject to product selection. 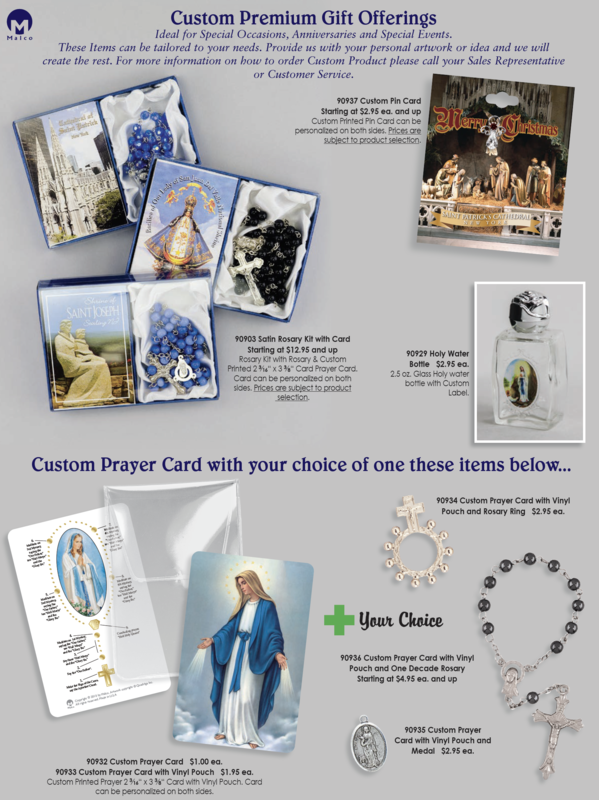 ORDER HERE - ORDER INFORMATION 90955 Rosary Card $1.50 ea. 90906 Rosary Ring Kit $2.95 ea. Card. Card can be personalized on both sides. ORDER HERE - ORDER INFORMATION 90916 One Decade Rosary Kit $4.95 ea. printed Prayer Card. Card can be personalized on both sides.